I am biased against processed foods. That doesn’t mean I don’t ever eat them or preach to others about what they have to eat in their own homes. In my home, though, there are very rarely any processed food products. When I cook for myself, I also tend to avoid foods that include gluten (a wheat protein), which rules out just about every processed food. I don’t have an allergy or intolerance, I just find that I feel better and have more energy when my diet is heavy on proteins and produce. But I do love me some pasta, and will indulge from time to time. One of my main goals in bringing people stories on my food site Mouth Of The Border is to show you how ethnic neighborhoods all over the city create healthy, delicious and endlessly exciting meals, usually doing so on less money than the average New Yorker spends on takeout food in a week. It’s also my goal to show you how to recreate those meal using items they can buy in your own grocery store (which is why testing this Philly Cream Cheese recipe is interesting for me). That said, there are more people reading this site who don’t cook due to lack of time, not lack of money. Many of you won’t go to Chinatown and pick out fresh poultry and vegetables. You won’t come home and break down a chicken and marinate it and spend the balance of an afternoon chopping and julienning vegetables. You just won’t, no matter that it would only cost you $15 to feed a family of 6. For you guys, you don’t mind cooking if you must, but the recipe better be quick and super easy. For both groups – those who don’t cook for lack of money and those who don’t cook for lack of time – there are recipes that will get you in and out of the kitchen in no time that are cheap and flavorful without tons of additives. As an experiment, and to prep for testing the Philly recipe, I wanted to see what I could get at the grocery store that would yield at least six servings for under $30. One could use organic products to make this recipe more healthful. I didn’t. The only thing I looked at was the poultry. I chose hormone- and antibiotic-free chicken that had been “minimally processed” (which means very little in this country, but I was sticking to the budget). It took about 20-25 minutes to put everything together. I poached the chicken breasts in water in the microwave while I let the onion and green peppers soften. 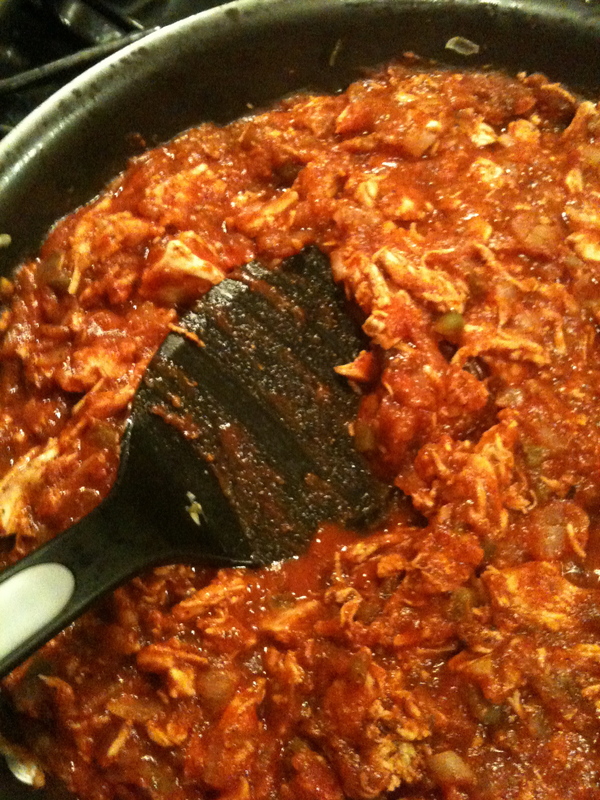 I shredded the chicken, then added the meat and everything but the dairy products to the pan. 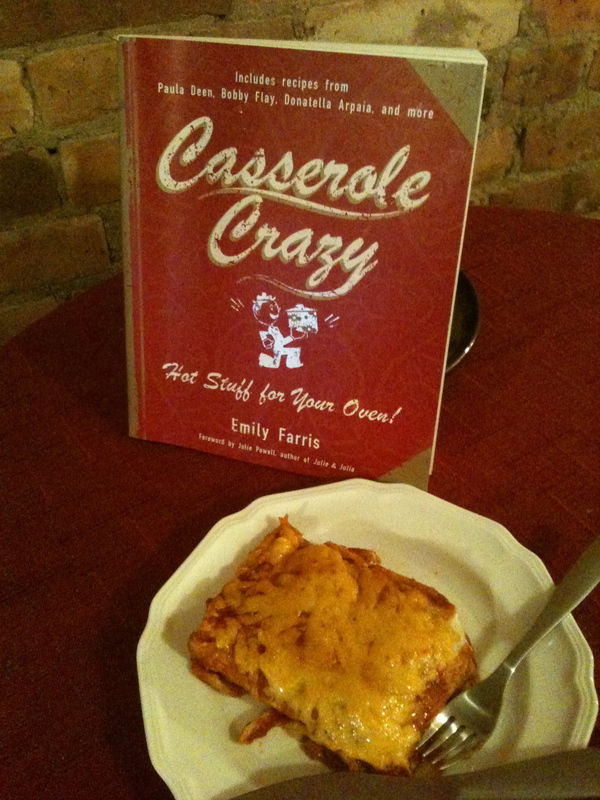 Once everything was well-mixed and cooked through, I stirred in the sour cream and shredded cheddar (shredded it myself – blocks of cheese are almost always cheaper). Below are some photos from putting dinner together. All the way at the end, I made you a video that shows you in under a minute how to make these enchiladas. All the fixins (and nothing's fancy). 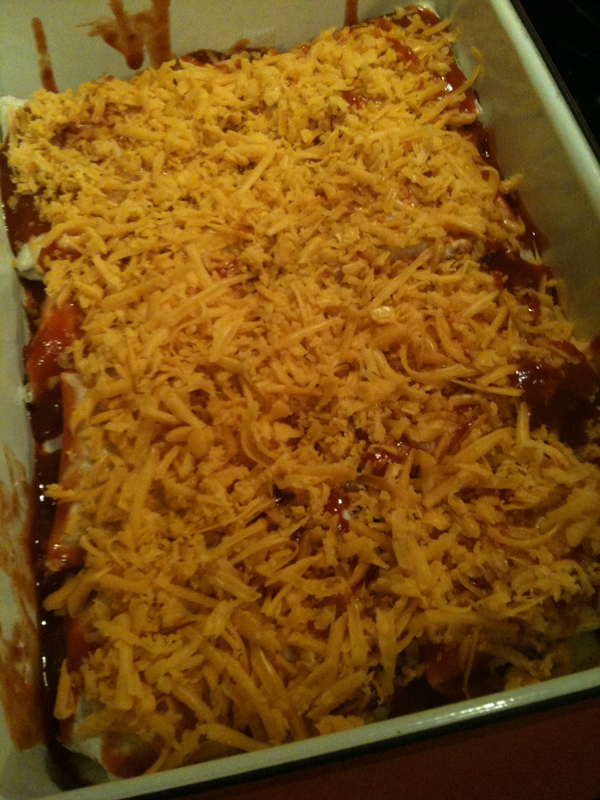 Cheesy Chicken Enchiladas ready for the oven. What are your thoughts on processed food? Do you think it’s better to cook at home, even using processed food products, than to eat out frequently? This entry was posted in Eating or Cooking and tagged cheese, cooking, enchiladas, food, mexican, philadelphiacreamcheese, recipes, wholefoods. Bookmark the permalink. Cream cheese: Forgive me, but I can’t help but wish you would do it anyway. I was thinking, wait, is cream cheese processed? I don’t even know. 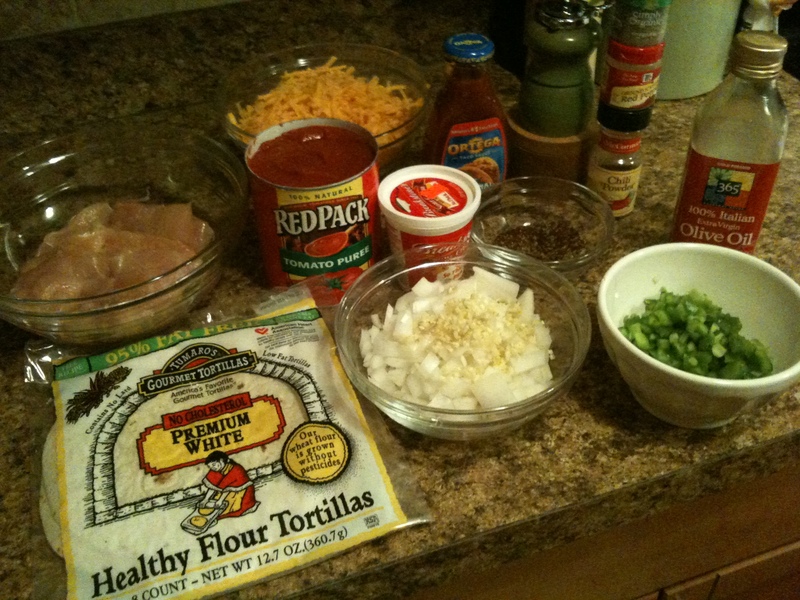 Enchiladas: YUMMY. I could make this and leave out the spicy stuff! You make it all so easy-seeming. I think I need to get that book. Where’s the video you mentioned, though? The video is there now! I will test the cream cheese recipe – just for you! And yes, please do get the book. So many inexpensive dishes that last for days. Also, you can certainly take out the spicy spices and sub in other flavors to suit your palate. These enchiladas are delicious! I do a lot of home cooking myself – and I have preservative allergies so the food is minimally processed – but I have a whole other problem here. I’ve NEVER seen enchiladas made with flour tortillas. They tend to disintegrate under sauce. Corn tortillas, on the other hand. . . I don’t really like using corn tortillas when I cook. I find the opposite is true for me – flour ones hold up really well to sauce, and the corn ones fall apart. Also, I don’t like the taste of corn tortillas unless they’re used in freshly made tacos. You cannot have an enchilada with a flour tortilla. It’s a burrito. That’s like calling a soup with no roux gumbo or calling meat made on a gas grill barbecue. It’s not right. 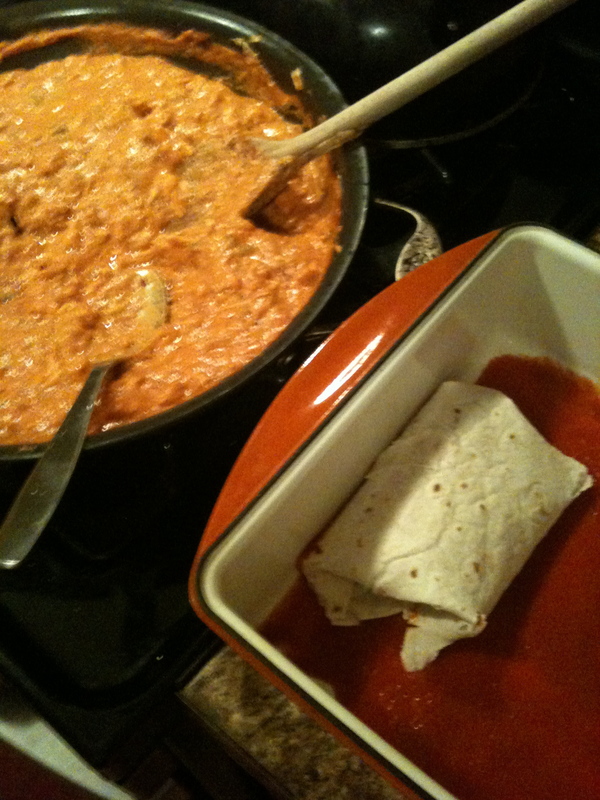 Then I think I have only eaten burritoladas in the recent past. PS I have a charcoal grill and have no idea what I’m going to do with it. First the recipe looks yummie. As you know Paul loves to cook and we’ll go to as many grocery stores as possible to get everything. Of course that also means that our Sat is pretty much done. Paul is losing weight and I’m sensitive to certain foods not in that I’m allergic but I get tired when I eat certain things. When I met Paul and we started using natural ingredients and I was already doing the free range thing, I got more energy. When I eat out sometimes I can tell when I’m eating processed foods and so we try to go to restaurants that don’t. It’s worth spending the money and taking the time (we cook over the weekend to stock up). I am going to try the recipe though! Those aren’t enchiladas. Not even close. But we went over that on Facebook. I can do this all day. Let me know if you want more. Cream cheese is a staple for camp cooking. Yes, leave me as many cream cheese ideas as you like — but they are having me make a red meat sauce with it. You’ll probably cry. I’m including your suggestions as part of that post. Cream cheese in enchiladas sound all sortsa wrong but then again, cream cheese makes everything right. Can you tell I love cream cheese? Cream cheese, a can of chicken (yes, can o’ chicken), packet of ranch dressing and pecans. Roll in ball and serve with crackers. 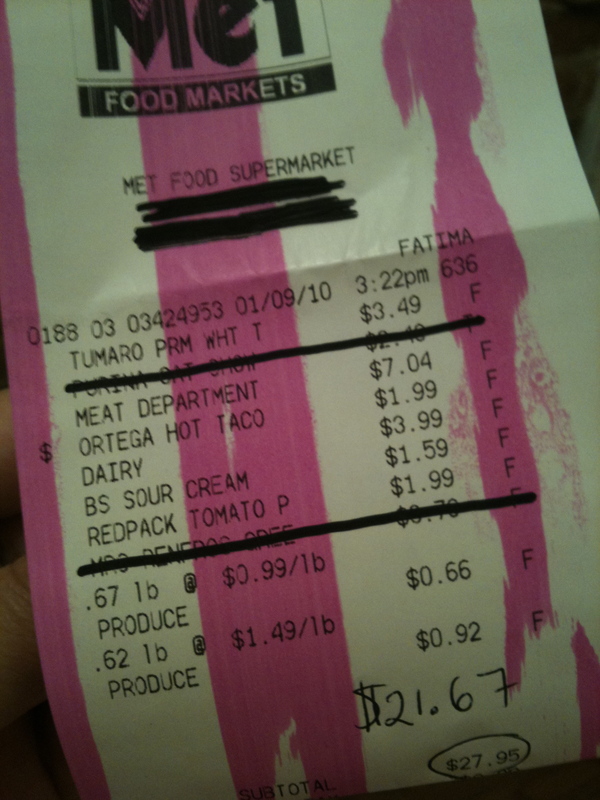 Oh, and can you also tell I have no issues with processed foods? Yay Mona!!! Love seeing you all up on my blogness. I love the cheese ball in all its forms, and I am not above making this recipe for my Super Bowl party. Mmmhmmm. That can of chicken thing is kind of dubious, though. Kinda creeps me out. Hmmm is it better if we cook at home, even using processed food products, than to eat out frequently. I would say it would be better to eat out cause you can probably find healthy food if you want to, especially living in NYC. Ok cream cheese recipe –> for Christmas I made a cranberry cheesecake. Make the original cranberry sauce (cranberries, sugar and water) and let it cool, then swirl it in the cranberry sauce into the cheesecake and bake. Its tart, creamy and sweet. That cheesecake sounds amazing. Wow! Thanks, Melissa. And props for making the cranberry sauce from scratch!